The south section of the Pembrokeshire Coast Path can be completed comfortably over 6 days by the average fit walker. 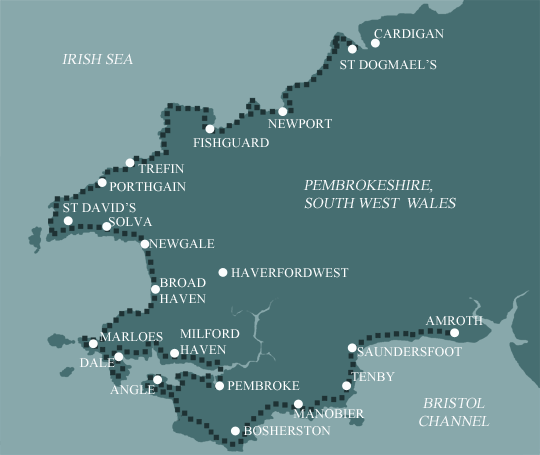 This section includes the wonderful beaches of Broad Haven and Barafundle as well as many sites of historical interest, including Pembroke Castle and Manorbier Castle. Beautiful beaches mixed with modern industry and maybe even gun fire! The beautiful beaches and tourist attractions around Tenby make this the busiest section of the whole route with superb views of Caldey Island, and the coasts of The Gower and Exmoor. This section really typifies why this coast is worthy of National Park status. It contains Barafundle beach which was recently voted one of the top ten beaches in the world! It also fringes the famous Lily Ponds at Bosherston which are a National Nature reserve. Care needs to be taken at Broad Haven where the tides and artillery range can make for a detour by road. The path is quite undulating, but you’re never far from a beach or village pub. Also included is possibly the flattest section of the trail much of which is restricted because of military use. Despite being a firing range, this ranks as one of Britain’s most important wildlife sanctuaries and is protected by some of Europe’s strongest designations. This final part of this section is very rugged and once away from Angle village it is deliberately managed to retain a ‘remote and challenging ‘ experience. The entire stretch is coastal – no roads, no houses, few stiles and no amenities at all. Unfortunately a large part of the section around Milford Haven is not within the National Park due to the proximity of industry associated with the haven. It is however still a very interesting walk rich in history, environmental and agricultural interest. The historic town of Pembroke and its castle are well worth a visit. The most popular section of the entire path. A mixture of woodland cliff top walking, sandy coves, the historic town of Tenby, pretty villages and some of Britain's award winning beaches. By Public Transport: Train via Cardiff for main city links. By Road: A40 to Carmarthen, A48 and M4 for all directions. Although only just into the start of the route, this typical British seaside resort with a certain charm and sophistication is well worth spending some extra time in. Colourful houses perch above the harbour and South Beach while the well preserved mediaeval town walls hide a maze of crooked streets. From here Caldey Island is clearly visible just to the south. Monks have been on the island for around 1500 years and about 20 monks live there now. Boat trips are available from Tenby and there is plenty to see on the island – unfortunately tours of the monastery are only available for men.